I was deeply saddened to learn today that John Anthony West has crossed from this mortal plane. My thoughts are with his son Zeke and daughter Zoe and with the rest of his family and closest circle. An eloquent tribute from Graham Hancock can be found here. Readers of this blog and of my various books know that I hold the work of John West in the highest regard. His inspired analysis and tenacious pursuit of the evidence which shows that the conventional paradigm of ancient history is gravely flawed, and his exploration of the profound implications of that conclusion, almost singlehandedly (along with his friend and colleague, geologist and researcher Robert Schoch) initiated an entirely new line of inquiry into the forgotten wisdom of the ancient world -- and exposed the moral and intellectual bankruptcy of the attempts by the mainstream "quackademics" (his term) to suppress, ignore, or otherwise obscure that evidence and its implications. His book Serpent in the Sky continues to be a deep well of wisdom and insight to which one can (and should) return again and again. His writing, speaking, and research inspired the transformative generation of researchers that includes Graham Hancock, Robert Schoch, Walter Cruttenden, Laird Scranton, and many others -- and the researchers from successive generations which continue to arise as each new decade unfolds. "Geology, mythology, cataclysms and the world's ancient wisdom"
"John Anthony West on creativity, discipline, and consciousness"
"The cobra and the vulture"
"The high science of ancient Egypt"
"The Pythagorean '3' in Egypt and Lao Tzu"
"John Anthony West on the meaning of human existence" (written and published well before Red Ice Radio took its regrettable and misguided turn to the hard right). John West was a brilliant interpreter of the world's ancient wisdom, particularly that embodied in the art and scriptures of ancient Egypt. He described his approach as being of the Symbolist school, which I interpret as a way of saying that he was opposed to attempts to force a literalistic interpretation upon the writings and iconography of the ancients, instead perceiving that the practitioners of the world's ancient high wisdom expressed profound truths through inspired symbols. Not only did the ancients employ sophisticated and incredibly subtle metaphorical symbol, but (as John West also perceived and explained) they knew how to manifest shape and space and proportion and alignment and number to create effects in the realm of vibration in ways that have largely been forgotten today. His video series Magical Egypt delves into this symbolism and ancient wisdom, and is well worth watching in its entirety if you have the opportunity to do so. Even if you have already seen it, now would seem to be a fitting time to take the opportunity to watch it again, and contemplate the massive scope of John Anthony West's gift to humanity and to the task of recovering from what he described as our collective amnesia about our own past. Graham Hancock's powerful tribute to his friend and colleague, linked above, movingly cites the ancient Egyptian Book of the Dead. Alvin Boyd Kuhn argued (very convincingly, in my opinion) that when this ancient Egyptian text describes "the Dead," it is actually describing this incarnate life, and our condition here as souls who are passing through the "underworld" of the material realm and incarnation in a human body. To the sages of old time the coming was a constantly recurring and only typical [that is, "purely symbolic"] event. [ . . . ] Horus, a form of Iu-em-hetep, was not an individual historical person. For he says, "I am Horus, the Prince of Eternity." [ . . . ] Horus calls himself "the persistent traveler on the highways of heaven," and "the everlasting one." "I am Horus who steppeth onward through eternity." Here is wisdom to nourish the mind and lead it out of its infantile stage and into maturity of view. Horus declares himself forever above the character of a time-bound personage. Let moderns ponder his other mighty pronouncement: "I am a soul, and my soul is divine. It is the self-originating force." It can perpetually renew itself [ . . . ]." 546 - 547. 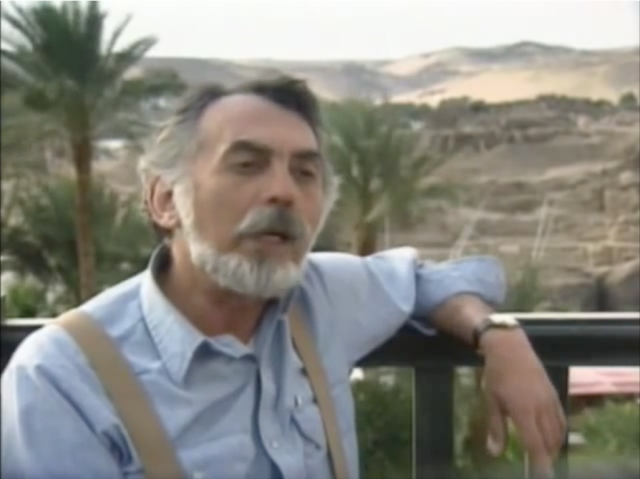 I am convinced that John Anthony West understood the most sacred texts of ancient Egypt, and their teaching on the eternal path of the divine and undying soul, which itself is "the persistent traveler on the highways of heaven." I am convinced that because of his deep study and his penetrating insight, he knows how to navigate those highways. Not only that, but he strove mightily within this life to share what he knew and to pass it on to others in every way and through every medium that he could. Those of us who have been touched and inspired by his life and work can join together in saying to him, "Go in peace, John, stepping onward through eternity."